Islamic State-affiliated jihadists Sinai Province, previously known as Ansar Beit Al-Maqdis, have released a video showing their attack on a microbus in North Sinai's Al-Arish, which killed three judges and the driver on 16 May. 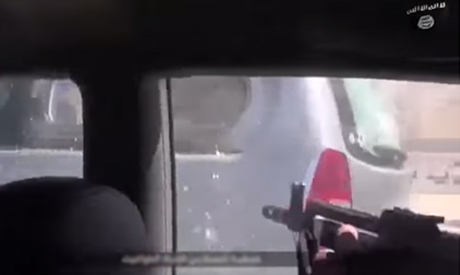 The video shows a vehicle following a microbus, then approaching it from its left, after which gunshots are fired at the microbus, shattering its windows and penetrating its door. A title at the bottom of the screen reads "Assassination of five of the tyrant's judges." Ansar Beit Al-Maqdis pledged allegiance to the Islamic State jihadist group on 30 June 2014, after which it changed its name to Sinai Province. The Salafist jihadist group has carried out a number of attacks against security forces, inside and outside Sinai, and was designated a terrorist group by Egypt, the UAE, the UK and the United States. On Monday, an explosion targeting the convoy of Prosecutor General Hisham Barakat left him injured together with five other security members and one civilian. Barakat is being treated at Al-Nozha hospital in Heliopolis.